We welcomed a new member into our book club last year and she hosted the first meeting after our summer hiatus. Elise Juska’s novel The Blessings was Margo’s selection and our discussion of the book – which I didn’t particularly enjoy while I was reading it – was certainly elevated by her superior hostessing skills. Oh, and okay, listening to the other women in my group talk about the book did soften me towards it. A bit. The Blessings is the story of a large Irish-Catholic family in Philadelphia. You’d need a chart to untangle the siblings and cousins, the spouses and parents. There’s Gran and Pop; their children, John, Margie, Ann and Patrick and then the kids. Their story – played out over twenty years – isn’t really follow a linear narrative. Instead, Juska unfolds the story, or parts of the story, by allowing us to ‘visit’ with some of the family members. If every family has a certain kind of music, Abby’s is the murmur of sympathy around a dining room table. It starts in the pause after dinner and before dessert, when the men migrate to the living room and turn on sports, and the women surround the wreckage, spilled crumbs and crumpled napkins and stained wineglasses. They pinch lids from sugar bowls and dip teabags in hot water, break cookies in half and chew slowly. They trade stories of other people’s hardships. This is the melody, the measure , of her family: the response to sad things. The novel moves in and out of people’s lives, allowing us glimpses of failed relationships, eating disorders, love affairs, and deaths. For me, the narrative was too broken up to allow me to feel connected to any one of the characters. Just when I settled into the rhythm of their story, the chapter would end and we’d be on to the next person. Sometimes what had been happening would be alluded to later on, but we’d be hearing about the event from a completely different perspective. The Blessings was like reading a series of connected short stories. The truth is that life in the end – even a long life – amounts to a handful of a very few things. The longer you live, the shorter the story. 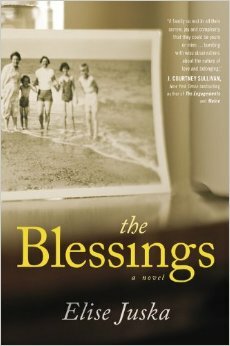 The Blessings is a quiet story about family and if you’ve got one, you can probably relate to this book in some way. This entry was posted in Uncategorized and tagged book club pick, literary fiction by Christie. Bookmark the permalink.